So yesterday, we went out to dinner at the local Chinese buffet, which is a long time family favorite. I only ate food I thought was safe. This morning, my guts were in an uproar and my belly hurt so badly that I almost turned around on the way to work. I decided to press on, because hurting is hurting and where I’m located doesn’t really matter unless I start throwing up. Then it matters quite a bit, but I digress. At my doc appointment last month, I got a referral to an allergist….in DC–four hours away. I have not been successful in getting a Health Choice option for that. But! As I was rolling down 30 West with a painful belly listening to podcasts, one of the sponsors was everlywell.com, which offers a food sensitivity panel covering 96 foods for less than 200 bucks. I bought one almost as soon as I sat down at work, which may not seem like a rational choice until you consider that I would have to miss an entire day of work AND burn an entire tank of gas to visit the “free” allergist in DC. Soon I will know: was it the yogurt in my breakfast smoothie that I needed to eliminate…or one the fruits? And is it all bread…or just the bread with a bit of corn meal? I don’t even have to visit a lab for a blood draw, just use the included lancet to poke my finger. Yeah, I know this sounds like an advertisement. I guess it is, but only because I am excited to get some answers. That link up there will save you money on your own tests. They have more than the food sensitivity one, but nothing else I needed. This entry was posted on May 10, 2018, in cass buys stuff, cass talks about herself. Today’s visit was slightly less frenetic, quite a bit spendier, and yielded a sizable bounty of fabric goodness. The place was almost empty, so I could get to all the tables, including the cutting station. 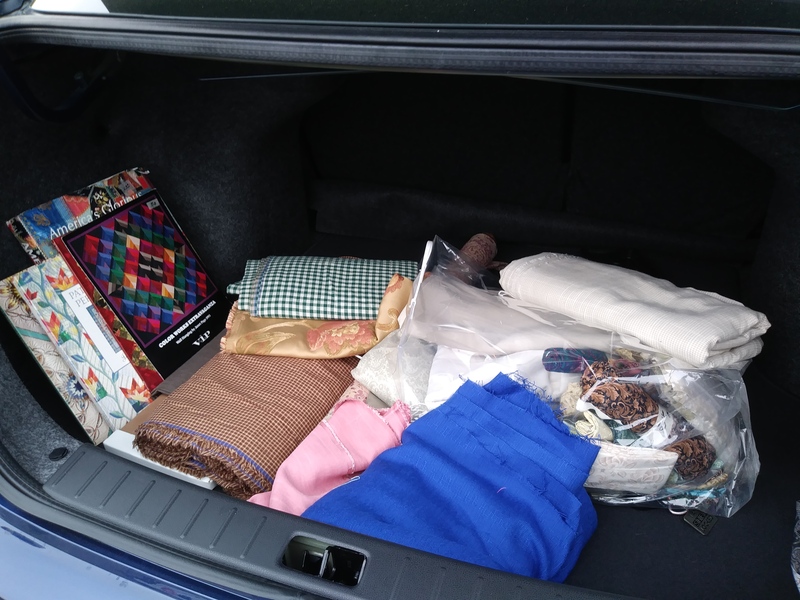 There are several sizable pieces of linen there -as well as cotton- for period garb; a few blends for skirts/pants for me; some fat quarters and bits for quilting (of course); and some books, both beautiful and instructive. The best part was starting the day with my gal pal, Patti. The saddest part will be negotiating with Rob tonight over who gets which fabric! This will also lessen the financial hit, so somewhat bittersweet. Depending on how the negotiations go, I may not need any more fabric until next year’s fair. Which is not the same as saying I won’t buy more fabric. These are two different things entirely!! This entry was posted on May 4, 2018, in cass buys stuff. Oops! I almost forgot to post today until I noticed that open spreadsheet tab. Not that I plan to post every day this month, mind you, but I am not yet far enough along on the 10K word goal that I feel comfortable skipping. Not much has happened since I posted yesterday, except that the fabric I thought my oldest son might like came in yesterday– 24 fat quarters worth. It’s Hanami, from Connecting Threads, and I really like it. I plan to make a Dresden Coin with it. I think the simple pattern in high contrast fabrics will work well for him, and it’s the least I can do after cheating him on his color vision genes. He was able to identify 22 separate fabrics on his phone, and he likes them, so I think we’re good. I’ll need to order some sashing and border fabric, but that can wait a minute because I’m still working on Daughter Number Three’s Strip Dash. Alright, that’s it for today. Have a good one! This entry was posted on May 3, 2018, in cass buys stuff, cass plans. So. Item number one: My friend Patti invited me to a 10,000 word challenge. And for some reasons that I am still not quite sure of, I agreed that this was a great idea and accepted. Therefore, you can expect 10,000 words this month. Most of them will probably be random, but whatever. Words. Item number two: I am 10 seams away (7 at 22 inches and 3 at 88, but who’s calculating?) from having another finished quilt top. Expect to see it soon. Item number three: My bowling season ended last week. What the hell am I supposed to talk about if I am not bowling? Oh, I remember! I signed the whole fam damily, kids and adults, up on the kids bowl free site. If you’d like to take your family bowling all summer check them out at kids bowl free. Yep, that’s referral link. I didn’t get paid for it, but may win a prize if you use it. Kids must be 18 or under, and shoe rental may or may not be included depending on what your local bowling center decides. The program is nationwide, but it’s up to each alley to participate or not. And, FINALLY, item number four: I took delivery of my new car yesterday. 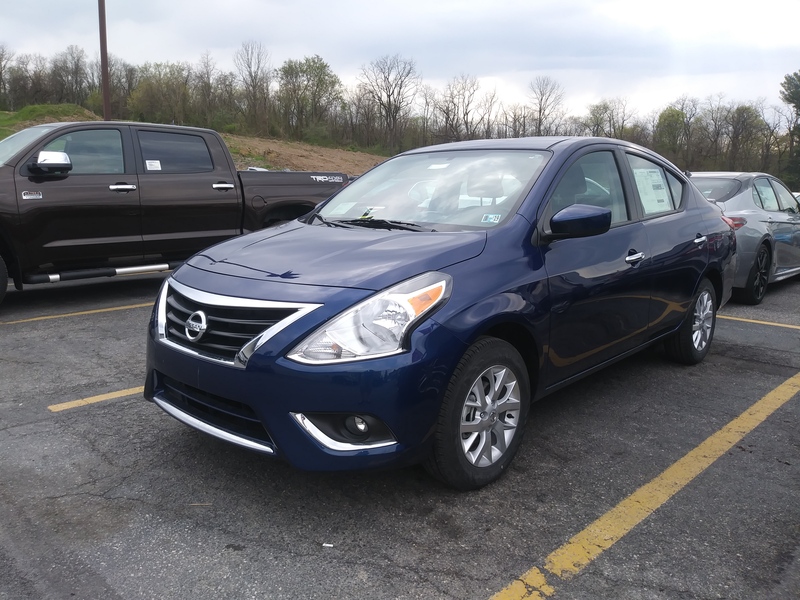 It’s a 2018 Nissan Versa SV Limited Edition in Blue Pearl. The interior is charcoal. 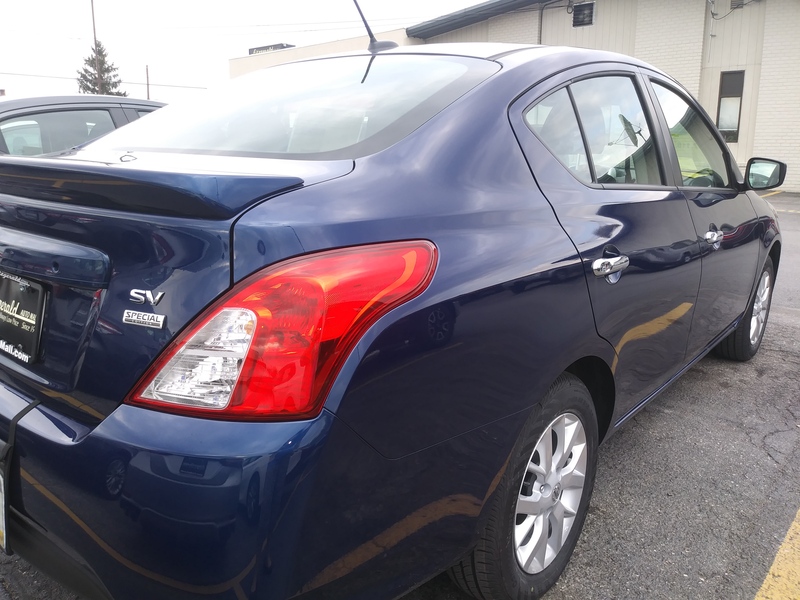 This is the very first time I have decided “It’s time for a new vehicle,” done my research, gone to the dealers, conducted multiple test drives, picked out an actual NEW vehicle, financed it myself, and registered it only in my name. I feel like such a big girl now! I did have a bit of help from my partner, who is substantially taller than I am– to wit: he sat in my final two contenders to ensure that he and his equally tall son would fit comfortably in the vehicle. If they fit, anyone else I care to let me ride with me will also fit. Done deal. I love that this car drives very much like the Nissan Sentra I’ve been driving, minus the shifting part. I was comfortable right away and able to reach intuitively for the major controls. Also, it integrates with my phone via Bluetooth. Also, I can retire my seat cushion because the driver’s seat is height adjustable, praised be Freyja! 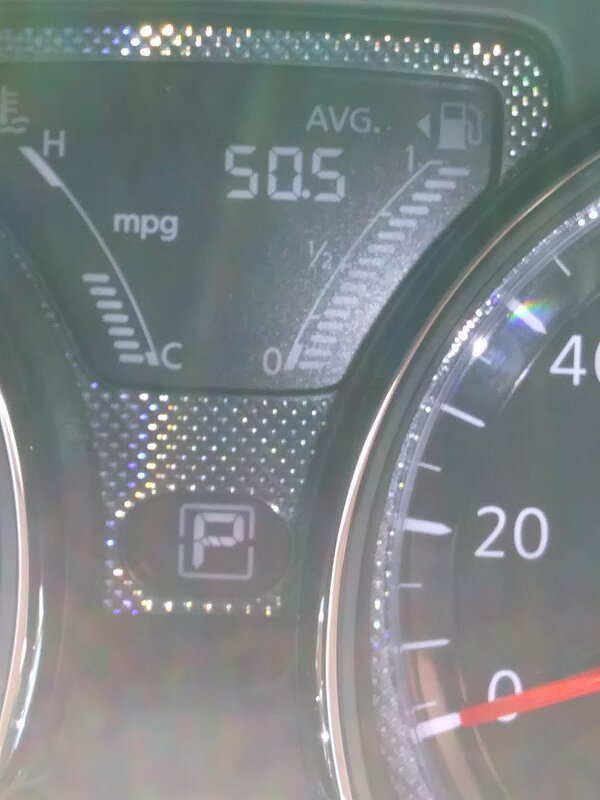 Also, check out the last picture to see the average MPG on my way home last night. WHOA! Not quite sure how that happened, since it’s rated at 31 city/ 39 highway and the way home is a combination of both, but I’ll take it. The Sentra gets 38ish, so this was a nice surprise. I’m not sure what her name is yet. At first, I thought it would be Jane, because the car is rather plain, but after driving her a bit more, I don’t think that’s quite right. She does not drive like a Jane. Previous vehicles have been named Beatrice and Matilda. Any suggestions? This entry was posted on May 1, 2018, in cass buys stuff, cass is thankful, cass talks about herself. In which I freely admit to skipping a week because I was reorganizing my room pursuant to the removal of a huge corner cabinet and that was more important than letting you know there was minimal progress on my other goals. I’ve been finishing that reorganization and cleaning this week, so there still hasn’t been much progress. But I am getting back on track: I knit yesterday and brought that third scarf to 1/5 done. I still aim for a March finish. I also unearthed the February books and will get back to them after I publish this post and make the chicken salad for this week’s lunches. I read extra in January, so I am still good for the year, but I am sure Sarah is waiting on my March selection, which I cannot in good conscience give her until I finish her February book. But heads up, it will be A Wrinkle in Time, so I can see the movie with the book fresh in my head. Speaking of movies, I saw Black Panther last weekend. It was entertaining, but I was unimpressed with the sociological message behind it. Or maybe the lack of same. There were vibrant Black characters, which I was glad to see, but viewed through my social work lens the conflict between the “good and peaceful” king and his “violent and bad” challenger just didn’t work. It tasted like a rehashing of the argument about whether marginalized peoples should protest quietly/peacefully or angrily/forcefully. The crisp, grammatical English spoken by the king juxtaposed against the more sloppy enunciation of the challenger was also frustrating. It may be my own white ignorance, but I think the movie played to stereotypes of some white folk’s ideas of acceptable Blackness versus unacceptable Blackness. UGH! You can do better, Hollywood. You need to do better. Show us more strong Black characters without the Uncle Tom’s Cabin overlay. The little scene after the credits started did a bit to alleviate my concerns, but how many people saw that? Our family was almost alone in the theater when that happened, but we never leave until the lights come up–most people scurry as soon as the credits start. Yeah, I know that’s a controversial thing I said up there. Hate if you gotta hate, but keep it civil. The other thing I spent time mulling this week was Aristotle’s quote: It is the mark of an educated mind to be able to entertain a thought without accepting it. I was am troubled by how many people I know who cannot do this. Won’t do this. Whichever, effect is the same. This entry was posted on March 4, 2018, in cass buys stuff, cass has goals, cass makes things, cass rants. Behold my tarnished teapot, and then scroll down for the rest of the story. I asked the guy if the 6.99 cup and the 6.99 saucer meant the 2 pieces together were 6.99 and he said yes. I told him I wanted one and he walked over to the “precious” cabinet to get it for me. He looked at the shelf and he looked at me. And he said, “This is a whole set. I can’t break it. It’s 49.99.” “For all of it?” I squeaked. “Yes.” “I’ll take it.” And then I might have jumped up and down a few times. It’s Johnson Brothers Strawberry Fair, and the server alone was marked 49.99. The charger 24.99, and each little piece 6.99. All told, that’s about 250 bucks worth of Salvation Army-priced merchandise. I’ll let you go to eBay like I did to determine the real market value. P.S. No, I am not going to pay 400+ dollars for the matching tea pot. Oh, and I had looked at this set when I went with all the kids last Thursday, but did a rapid calculation and didn’t even ask about it. Clearly, this set was meant to be mine. Amazing, no? Then, we went on the Goodwill as planned. We found a lovely china teapot and checked out. As I was paying, I looked across the store and saw some breakable things on a set of shelves hidden behind a rack of clothes. I told Jasmine to finish up and walked over to look. One of the things on that shelf was the set you see to the left in the picture above. No maker’s mark, just Made in Japan, but it’s fine enough that if you look through the cup from the inside, you can see the painting on the outside. 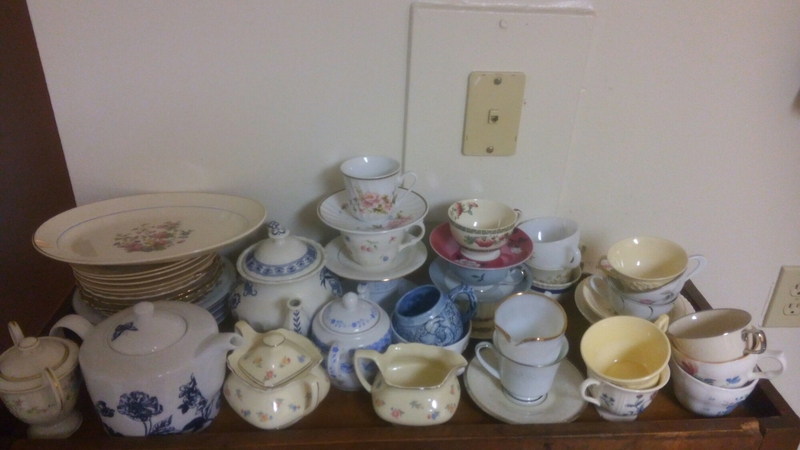 Twelve cups, twelve saucers, marked 12 bucks for the lot. So then, I have been thinking that I need a pot that vaguely matches these two tea sets. But then, I was thinking “but I haven’t paid full price for anything so far, why start now?” And then I decided to get off the internet and clean the living room. 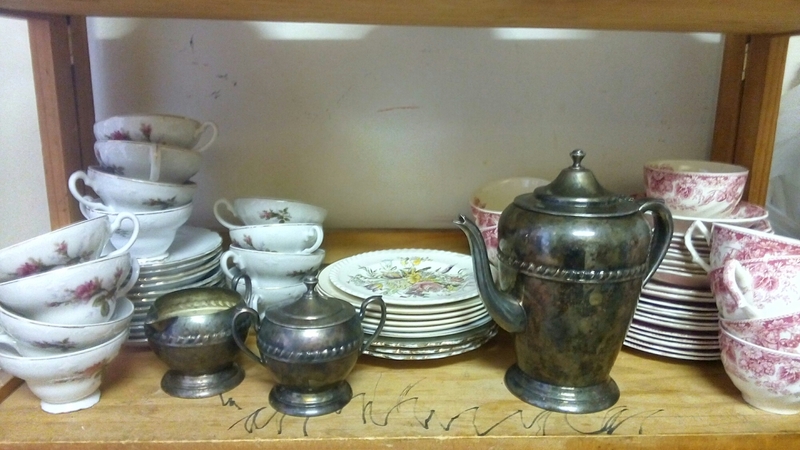 And as I was clearing the candy wrappers off the end table where Mother’s Silver Tea Service was sitting, I said, “Oh.” And then I took it into the kitchen to wash it up. This set belonged to my once-Mother-in-Law. 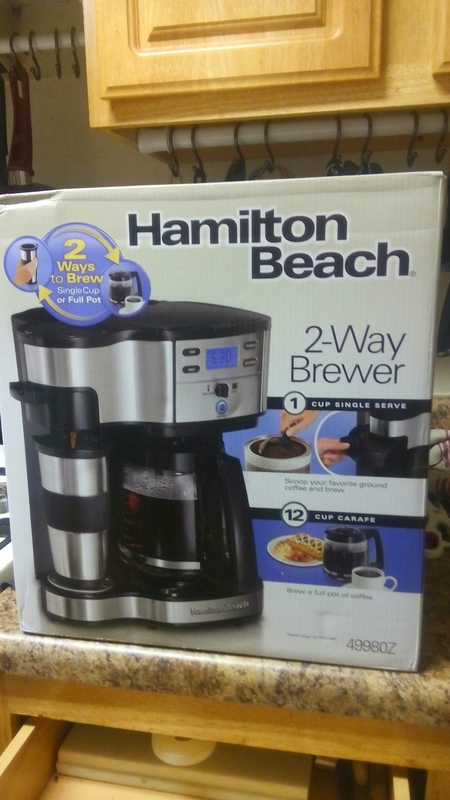 When she and Dad downsized to an apartment, I was asked if there was anything I wanted from her house. I asked for a ceramic kewpie doll, and this tea service. I’ve had it for….many years. More than 15, maybe as long as 20. And you know, I know it has a patina. It had one when it was given to me, and it is beautiful to me just like it is. I could polish it up and it would be shiny. But that verdigris has character. That oxidation has taken this teapot from something I have to take care of to something I can use to bring me, my children, and my guests joy. And it is worthy to be used with my best tea things. Now, I need a china cabinet. They had those at Goodwill, too, and really cheap, but I currently lack the man-power to get one up the stairs. Currently. This entry was posted on February 4, 2016, in cass buys stuff, cass is thankful, cass remembers. I’m officially taking a break from Project 365. I’ve done it for several years, and I have enjoyed it. But. I think less is more can also apply to digital noise. And though I sometimes have great stories to tell, I don’t have great stories to tell every day. As you well know. This particularly applies to work days. I *cannot* take pictures at work. And no matter how great a story I have about what happened at work, it has to stay at work. So. Moving on. 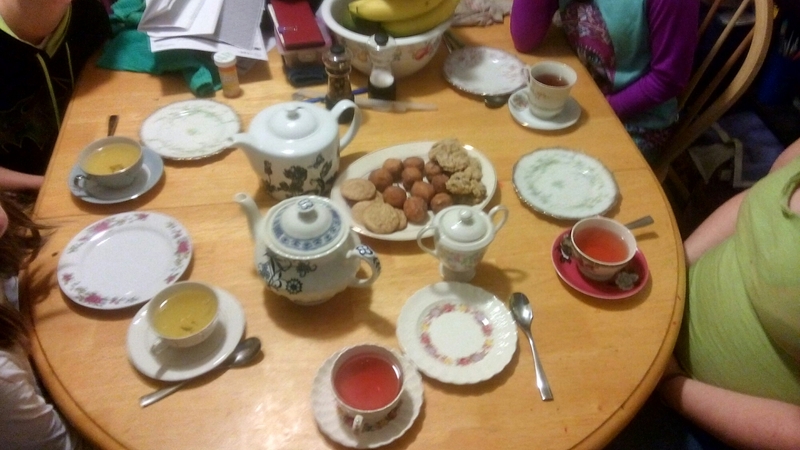 I have a Facebook friend who frequently posts pictures of her afternoon tea. I found myself getting envious. I mean, to take time out of the day and prepare delectable edibles, steep an actual pot of tea, and reconnect with family? And serve it on pretty dishes? Who does that??? SHE does that. And I wanted to do it, too. So I did. Here we are having tea. At 6:30 pm. But we had tea yesterday. And we will have tea again! “Cass! You know tea is served in the afternoon, not in the evening! What ails you?” Well, it happened like this. Jasmine came out of her room yesterday and said, “Since we are all home can we do a thing?” Now, I had a list of errands to run and really did not feel like dragging the kids with me to do them. But she was right, we are rarely all home for an entire day. I decided to take them on the errands and go get some lunch. 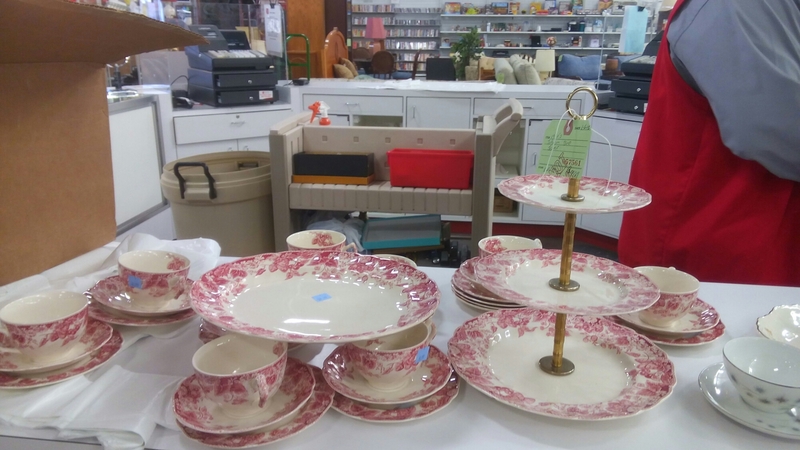 One of the errands was to drop off things at the thrift store. And I started thinking. About tea things. Now, I decided many years ago that I didn’t want anything in our home that I would yell at a kid for accidentally damaging. I don’t mean willful destruction. I mean fair wear and tear, and that includes dropping dishes now and again. Hell, I dropped a plate myself last weekend and broke it into four pieces. Anyway, with the exception of Grandmother’s rocking chair, which I keep in my room, I’ve held to that. I wanted pretty tea things to have elegant tea, but I knew I couldn’t go buy a tea set because I’d be mad if a piece were damaged. But there we were. At the thrift store. Where they sell things. So, I looked at the children and said, “okay, we’re going in. We are going straight to the back. Don’t get distracted. We’re only going in that one section.” So we did. We decided we weren’t going to go with sets, necessarily. It just had to be pretty, and actual china. That first store had quite a few things. And then we went to a second thrift store where we picked up a few more. And then a third. 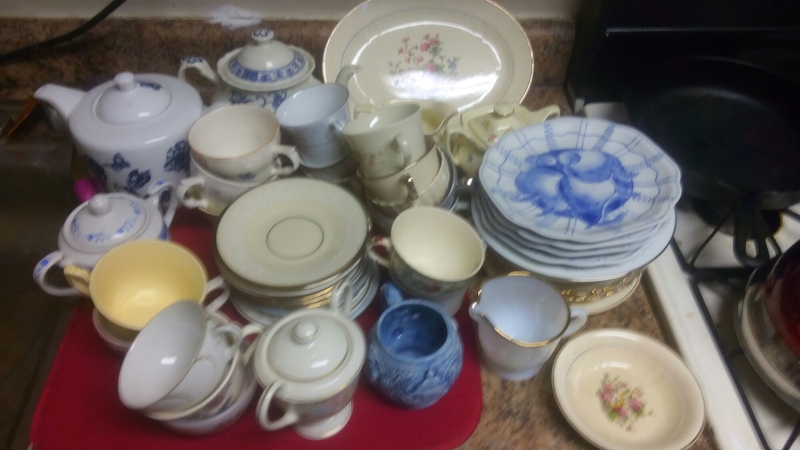 Tea was served at 6:30 pm, because we got home at 4:30, and it took me a bit of time to get it all washed, dried, and put away, even with Jasmine helping. We ended up with 20 cups, and I didn’t count the saucers and such. I ended up putting about half of it in the cabinet instead of on the shelf as you see it above. I discovered when I went to get the pieces I wanted to use that it was packed too tightly to be accessible. So now I have pretty tea things, and if a piece gets broken it’s no big deal because it won’t mess up my “set.” I’ll just pull a replacement down from the cabinet. When I run out of replacements, I will just go back to the thrift store. This entry was posted on January 28, 2016, in cass buys stuff. For steaming hot love… A whole pot at a time.